seriously y’all. this month, i’ve wanted nothing more than a big bowl full of oranges. juicy, bright, tart, sweet, orange. mmmm. i don’t know if this is a sign of some nascent vitamin c deficiency, or if i’m working out a mild jealousy that my parents are in pakistan during citrus season and have been drinking fresh-squeezed kino juice every morning. but here’s the result. step 1: i bought a couple of every kind of orange (and a grapefruit) available at food lion. blood orange, cara cara, and one whose name i can’t remember. step 2: wash and dry very well. zest each one into a small bowl with a microplane grater. the grapefruit really gave me some trouble but overall the zesting was well worth it. step 3: grab a serrated knife. 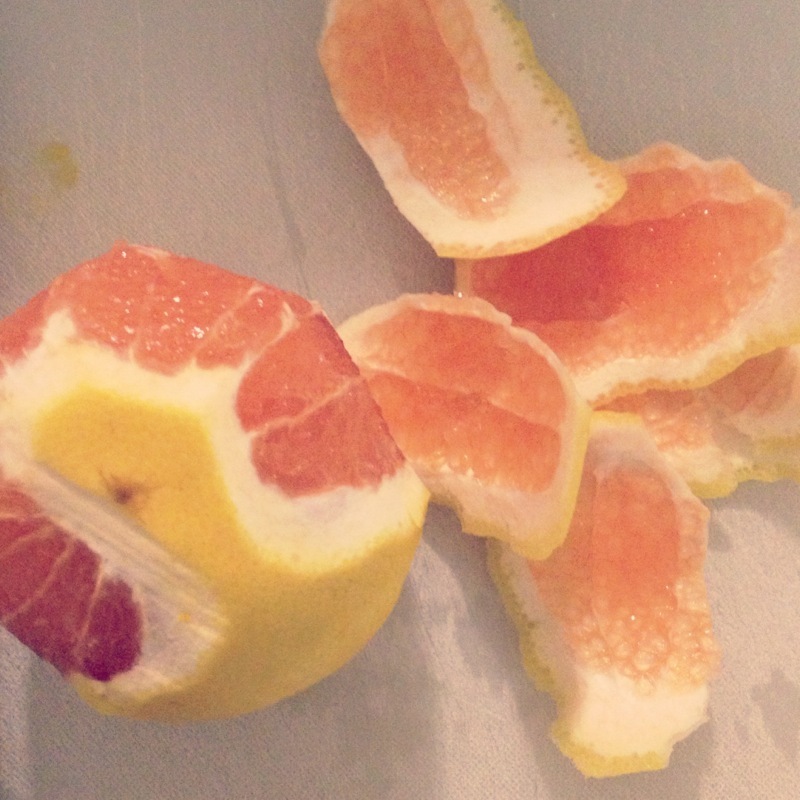 slice off a bit off one end of the citrus so it sits flat on your board. then, run your knife roundly down the sides, cutting off the rind as you go. 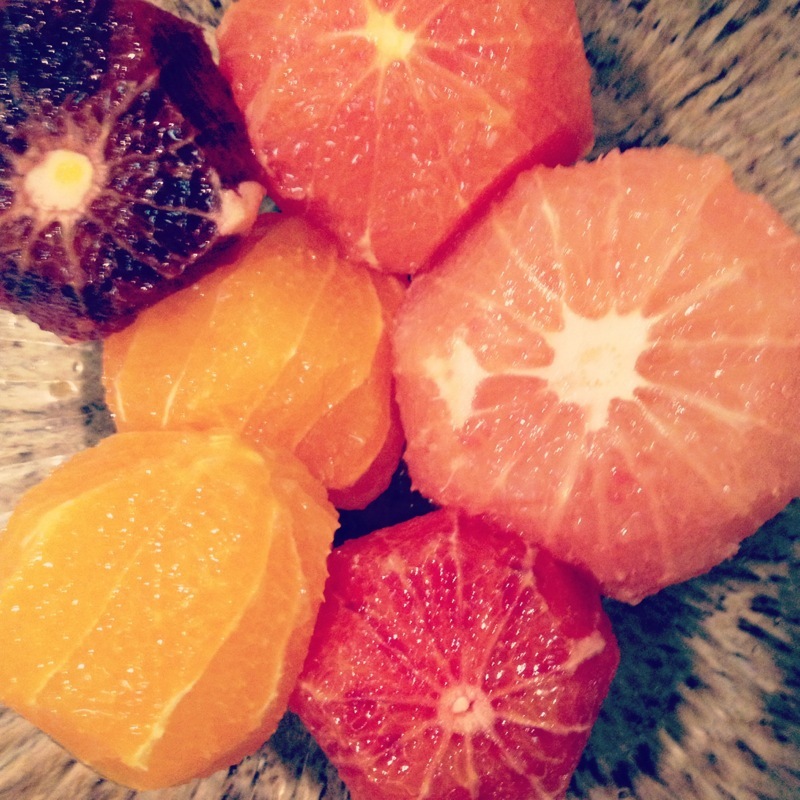 step 4: segment the fruit – hold each one in the palm of your hand. you see the lines running up and down? that’s the membrane that can be kind of fibrous and chewy in some varieties. not so great in a fruit salad. again using a serrated knife and working over your serving bowl (not the zest bowl), cut diagonally inwards between each membrane line. you’ll get little triangular segments and a bunch of juice falling into the bowl. when you’re done, you’ll have a mass of membranes left with some fruit stuck to them – just squeeze over the bowl and discard the rest. can we just marvel over these colors for a second? subhanallah. wait, taiyyaba, what do i do with the zest? OMG i’m so glad you asked. so, a couple of weeks ago (still during my citrus craving), i had dinner with friends at Zaytinya. it was super amazing (except for the snail kibbe….yeah you read that right), particularly this citrus salad with bright fruit, slightly bitter greens, pomegranate seeds, pine nuts, and a soft salty cheese. 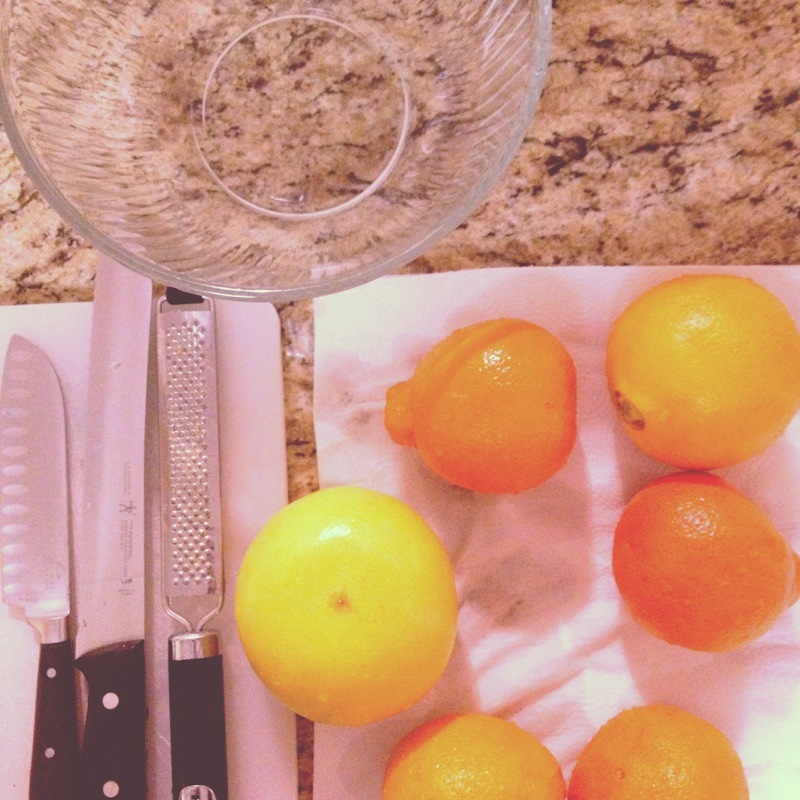 well, naturally, after i’d cut up all that citrus, i had to try it with the bits and pieces i had on hand. i’m kind of humble-proud about this vinaigrette. i need to keep working on the proportions but the flavors are really great. vinaigrette: citrus zest from several fruits; probably about 1/2 cup of mixed citrus juice, 1/2 cup of strong earl grey left over from making honey cake, half a tablespoon of honey, and a couple of capfuls of apple cider vinegar. whisk with some olive oil and a pinch of salt. dress some strong, dark greens (i used arugala) with this yumminess. bowl it. 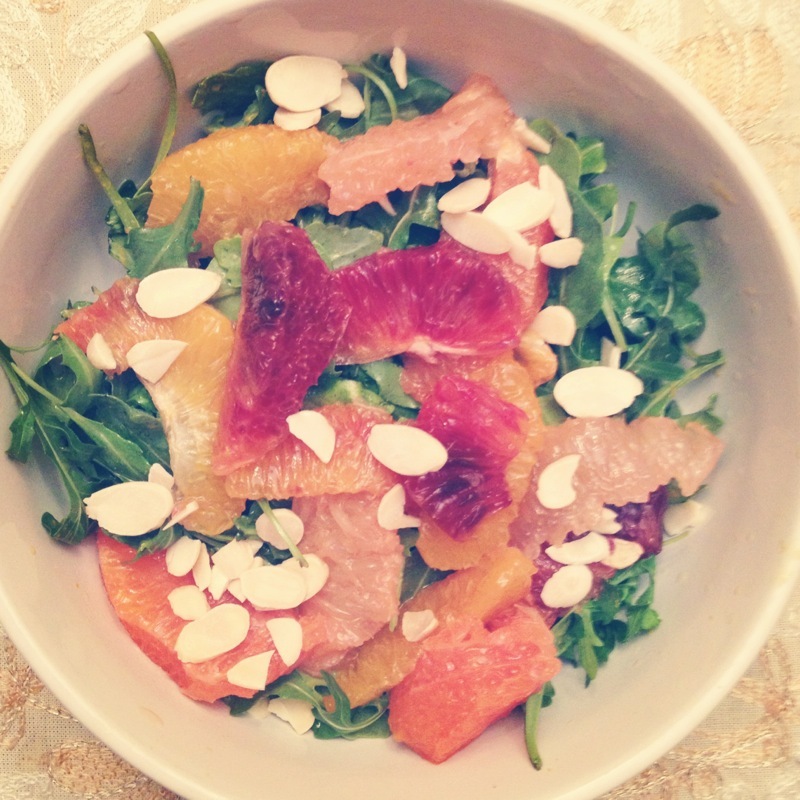 top with various and sundry citrus segments and some slivered almonds (if you have more wherewithal than i did, toast them first). nom it. some feta or ricotta salata would be awesome on this as well. I’m so glad you blogged this! It looks incredible.